With the Spyderco SpyderClaws, yard work is finally fun! The SpyderClaws are the ideal tool for garden topiary. Take your overgrown backyard from ordinary to extraordinary! T-Rex bushes, Imperial Destroyer hedges, or even a square shrub! You're only limited by your imagination. 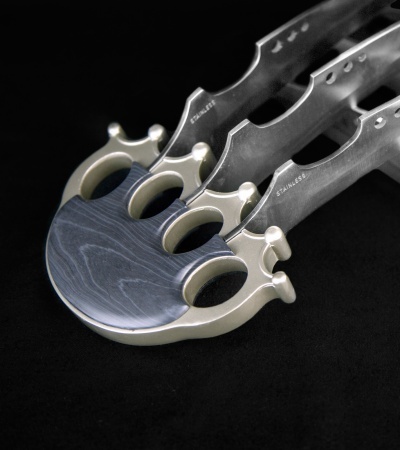 Each claw is made from stainless Adamantium, which offers eternal edge retention and anti-corrosive properties, as well as excellent Sentinel destruction. The knuckles are made from polished nickel brass with bluish-gray-blue G-11 scales. These gentlemen's claws are guaranteed to make your neighbors' green thumb jealous. 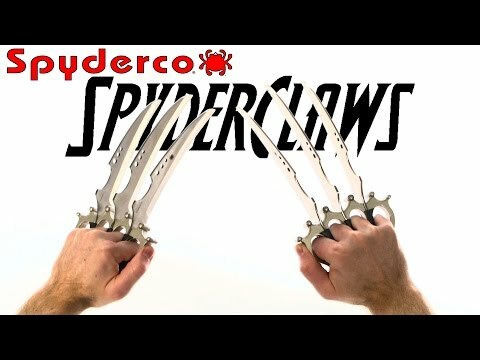 Disclaimer: These claws are THE tool when you need to both punch AND cut something, and make a great accessory to your favorite yellow leather jumpsuit. But they are made from metal. Should your arch-nemesis just happen to have magnetic powers you may want to choose another weapon. Just sayin. When I walked into my yard wearing a pair of these, my podocarpus, viburnums, and boxwoods, all trembled. Knowing what a butcher I was, they trimmed themselves with little effort from me. Worth twice the price. Spring is here, these will make great gifts for the entire family, grandchildren included. So... The concept was cool. But out of the Golden factory it didn't come too sharp. So I set it in the Wicked Edge and started to get work with the paddles. Little did I know I was skimming away flesh from my knuckles with every pass. I agree with the previous reviewer. Needs more bandaids. Also at this price, you'd expect slight more exotic materials for the scales. Maybe mokuti or at least zirconium. Spyderco kind of skimped out on these. I don't mean that. It's sarcasm. My kids love to play with these and I let em'... Not to mention grandma needed a hair cut and they saved me time and money. I don't think they should be packaged without extra bandaids. Thats why I gave a 4 star instead of 5, no bandaids. This is not a back scratcher. BE WARNED!! Now I have scabs on my back that itch worse than the orginal itch I tried to remedy. Great cutting ability, not very EDC friendly. These slice really well. Only bought one to try out, for starters. Probably could use some type of kydex thigh rig to make it more EDC friendly. Was wearing them at the post office while sending out a package, and it made it difficult to write, but handy to cut the tape. I think the guy behind the counter was afraid, but get with the times man! Great knife! 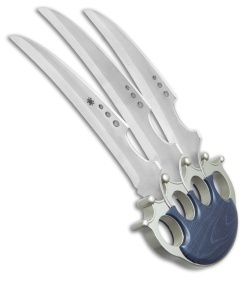 I love the claws, but will it void my warranty if I mod in two more blades? And will spyderco come out with an adamantium Sharpmaker? 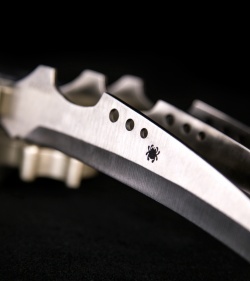 Unfortunately, modifying your Spyderco SpyderClaws will void warranty. An adamantium Sharpmaker would be great to see, but these blades won't be losing an edge any time soon! Just after I got my Spyderco SpyderClaws in the mail a group of ninjas attacked me in my home. I dispatched them quickly and easily with my SpyderClaws. If you can recommend a good product to clean up ninja stains I would appreciate it. We can only endorse this product for dispatching plants, shrubs and garden gnomes. I was hoping Sith Lord Kur'tns Phor-Yue would have another light saber offering this year, but these claws will complete my wolverine cosplay xD.